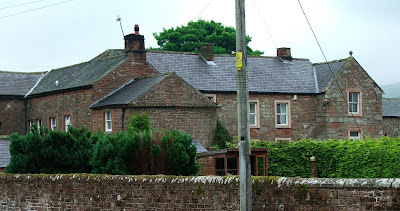 The small village of Croglin is about 7 miles North of Kirkoswald. The village sits astride the B6413, and consists of a tiny collection of houses, a church and a pub. The vicarage\rectory sits opposite the church of St John, a small church of 1878 built on the site of an earlier building. It is this earlier church, that is probably connected with the beautiful house that used to be the rectory or vicarage of Croglin. The house and its original tower, have variously been known as The Olde Pele, Rectory Farm and Kirkcroglin over the years. What can be seen today is a late 15th or early 16th century hall range, attached to an early 15th century tower house. Again, the two storey tower, on the right hand side of the above photo, would most likely originally have been a three storey building, flat roofed and possibly with battlements. The steepled roof, as is often the case, effectively disguises the original form and use of this type of building. The house and its tower can be seen from the roadside, although the garden's high wall limits the view somewhat...the best views can be had from the slight hill that the nearby church sits. A quarter of a mile down this cul-de-sac, a small building, now converted to a small dwelling, sits in the farm yard. This building is most likely a tiny bastle house, a small fortified dwelling for poorer farmers and their livestock. I unfortunately couldn't view this building as it's part of a working farm and hidden from view.